GT TDI PANROOF ! MEDIA ! FULL HTD LEATHER SERVICE HISTORY ! 99% FINANCE APPROVAL ! 99% FINANCE APPROVAL ! 2 KEY'S, COMES WITH SERVICE HISTORY ! TIMING BELT AND WATER PUMP KIT CHANGED AT 87,800 MILES ! FANTASTIC SPEC ! IN THE BEST COLOUR COMBINATION ! FULL BLACK HEATED LEATHER TRIM ! PANROOF ! UNMARKED GLOSS BLACK ALLOY'S ! MEDIA ! IN THE BEST COLOUR COMBINATION ! FULL HEATED LEATHER ! PANROOF ! MEDIA ! Upgrades - Parking Sensors, Rear, Candy White Paint, Panoramic Sunroof, Vienna Leather Upholstery, Cruise Control, Air Conditioning, Service history, Excellent bodywork, Black Full leather interior - Excellent Condition, Tyre condition Excellent, Standard Features - Air-Conditioning, Alarm, Alloy Wheels (18in), Climate Control, Computer, Electric Windows (Front), In Car Entertainment (Radio/CD Autochanger/MP3), Rain Sensor, Tinted Glass, Whiplash Protection System, 18in Interlagos, Heat Insulating Tinted Glass, Trip Computer, Seat Belt Pre-Tensioners, Seats Split Rear, 3-Spoke Leather Steering Wheel, Adjustable Steering Column/Wheel, Armrest, Body Coloured Bumpers, Central Door Locking, Child locks & Isofix system, Heated seats, Height adjustable drivers seat, Head Restraints, Lumbar support, External Temperature Display, Exterior Lighting, Anti-Lock Brakes, Airbags, Rear Wash/Wipe, Traction Control System, Tel. Prep./Leather Multif. Steering Wheel/BT ctrl., Sports seats, Mirrors External, Immobiliser, Front Fog Lights, Electronic Stability Programme. 4 seats, Solid White, ALL CREDIT/DEBIT CARDS ACCEPTED, FINANCE ARRANGED, PX WELCOME, £99 DEPOSIT RESERVES THIS CAR, CALL US NOW TO VIEW THIS CAR NOW ON 0191 477 8203 DAYTIME OR 07786 679 880 ANY TIME 7 DAY'S A WEEK. 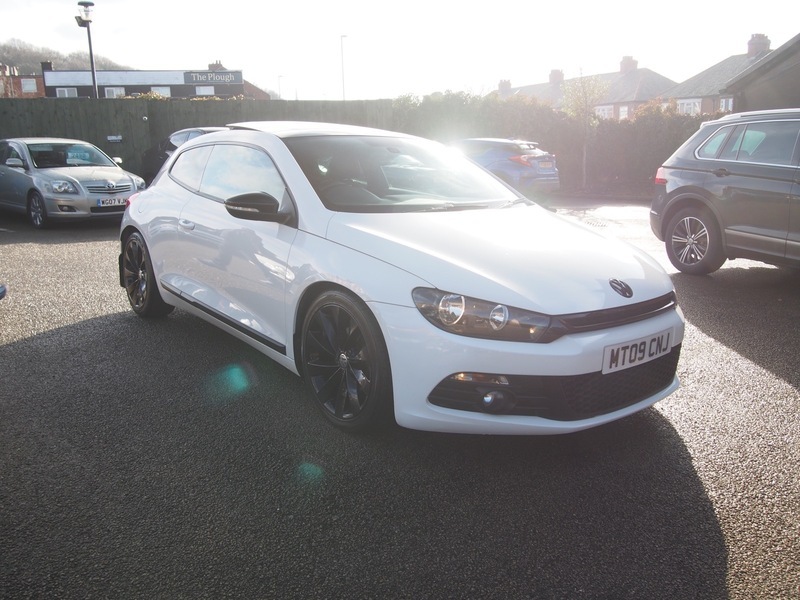 I would like to make an enquiry about your 2009 Volkswagen Scirocco GT TDI PANROOF ! MEDIA ! FULL HTD LEATHER SERVICE HISTORY ! 99% FINANCE APPROVAL !